Company-wide uniform Advisory messages by script-driven configuration of the Outlook Out of Office Assistant based on central managed templates and Outlook calendar appointments. OOF-Enterprise - THE solution for uniform Out of Office messages. OOF-Enterprise automatically creates company wide uniform but personalized Out of Office Messages and mail forward rules based on Outlook calendar appointments. Even in the unlikely case, that all your employees will follow your company-wide Out of Office message policies, you should definitely read on. With OOF-Enterprise, you can perform these manual tasks completely automatically, thus relieving your staff and increase the motivation to maintain the Outlook calendar carefully. 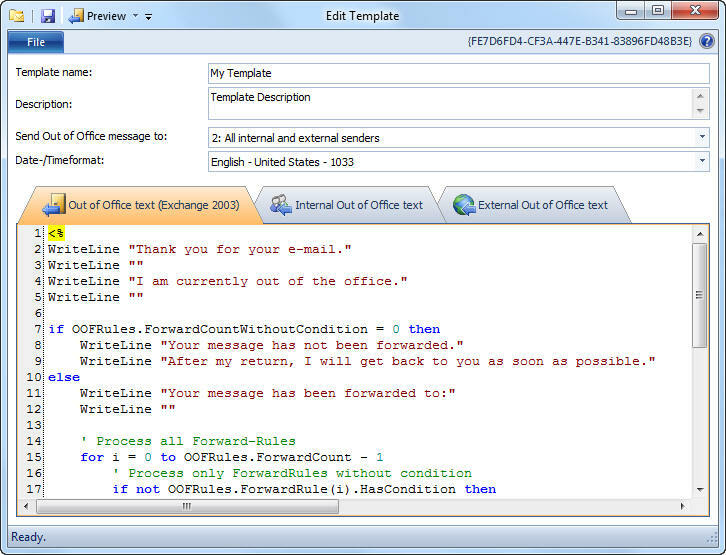 Create Out of Office mail forward rules to selected delegate or manager (from Active Directory/Exchange). OOF-Enterprise contains two components: The Manager and the Outlook-AddIn. OOF-Enterprise Manager will process these settings every day (usually during the night) via a scheduled job. Therefore it is recommended (but not mandatory) the execute OOF-Enterprise Manager on a server machine. However, it should not be installed on an Exchange server. Using the Outlook AddIn is optional. All settings can be done central with OOF-Enterprise Manager. In this case, no program installation on users computer is required. You may test OOF-Enterprise for 60 days free of charge to see, if it meets your requirements. Please do read the license agreement. prior installation. When the evaluation period is over, you have to purchase the required number of licenses or you must uninstall OOF-Enterprise completely from all your computers. You will need a license for every mailbox you want OOF-Enterprise to process. Please see our attractive volume prices. During the evaluation period, you will get free Support. Please let us know, if you have any questions, suggestions or problems. Registered OOF-Reset users will receive a discount on OOF-Enterprise mailbox licenses. Please contact us. You can import old OOF-Reset settings in OOF-Enterprise Manager.